Brown stew meat in oil, drain and set aside. Place stew meat in pressure cooker and fill 2/3 of the way with water. Close pressure cooker and heat until the counter-weight starts to rattle. Cook for 15-20 minutes while the counter-weight rattles. Remove from heat and place the pressure cooker in sink. *DO NOT REMOVE THE COUNTER-WEIGHT* Run cold water over the pressure cooker and using a fork, gently push the weight to one side to release steam pressure. When pressure is released, open pressure cooker and drain the water. In a separate pan, saute onion in oil until clear. Add the rest of the ingredients and simmer for 20 minutes, stirring occasionally. 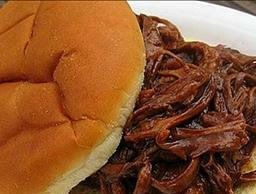 Using a sturdy potato masher, mash the cooked beef in the pressure cooker until shredded. Add sauce, stir and heat through. Serve hot on sandwich buns.